Born in Kuwait and raised a Muslim, Mark Halawa was taught that Jews are bad. Everything he learned about Jews warned him to keep his distance. This information was challenged when Halawa learned because his grandmother was born Jewish, he also was Jewish. 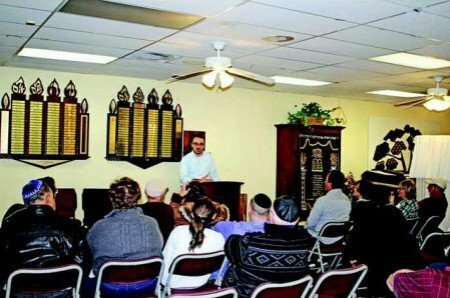 Mark “Mordechai” Halawa spent the evening at Chabad of SCV on February 19, speaking to a group gathered to hear his story. He shared his family’s history and the shock and later acceptance of Judaism. Halawa was born in Kuwait and grew up in Jordan. He spent two years of college in Latakia, Syria, fraught with partying and little studying. Later he left for Ontario, Canada to pursue his education seriously. One day in the library at the University of Western Ontario, Halawa met an old Jewish man. Intrigued by his appearance, with a long beard neatly pinned together, Halawa asked him about his background. During the conversation the Rabbi, Dr. Yitzchok Block Professor of Philosophy from Harvard University, asked about Halawa’s background. Halawa explained his family history and mentioned his grandmother’s story. Growing up, the family was told she was born Jewish, but after meeting their grandfather as a teen, she converted to Islam and was married. This was sufficient for the family to consider her Muslim; but Block had another idea. Block went on to explain the idea of matrilineal law, which says a person born of a Jewish mother is also a Jew. According to that tradition, not only was Halawa’s maternal grandmother a Jew; but so was his own mother and therefore also himself. The world seemed to spin for Halawa. Everything he had been told had been turned on its head. He argued with Block, explaining his grandmother had converted, so she was Muslim, not Jewish. “He told me a Jew can convert 10 times and would continue being a Jew,” said Halawa. His grandmother simply refused to talk about it. Slowly Halawa learned more about Judaism. He quickly discovered many things he was taught as a child about Jews were simply not true. “Everything I learned about Jews and the western world was wrong,” Halawa shared with the Chabad group. Now Halawa practices the traditions of his Jewish ancestors. Several years ago he traveled to Israel to further his studies. He decided to stay in the country and has lived there for nearly four years. He often thinks about his journey from Muslim to Jew, reflecting on one particular day spent with other Jews praying and singing. He remembers sharing his disbelief with Professor Block, but also feeling very welcomed.